Property Size 2,784 sq. ft.
Do you enjoy being the first on the slopes and the first at everything that you do? Well, be the first to stay in this brand, new modern town-home at the Escapes in Huntsville, located on the south shores of Pineview Resevior. Construction was completed September 2016 and the new homeowner has been busy outfitting the perfect furnishings for each space with tasteful style to complement this contemporary floor plan. The attention to detail will not be missed. The property has sleek, clean finishes throughout. A brand new Bullfrog hot tub is waiting for its guest’s enjoyment. Floor plan has two upper bedrooms, both with ensuite baths and a laundry room. 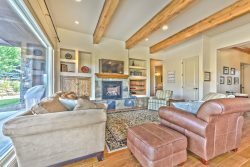 Open floor plan on the main level has a living room with gas fireplace, fully stocked kitchen with a pantry and new appliances and a dining room that flows to the covered deck for stargazing or outdoor grilling. The lower level offers a second living space with a bedroom with two (2) twins and full bath, overflow sleeping bunks, ping pong table, living area with TV and a walkout covered patio with a private hot tub. The spacious layout of 2700 SF gives a group of eight or less plenty of room to relax. The Escapes at Edgewater built by Jack Fisher Homes has a variety of residential concepts, from single-family residences to condos and town homes. It’s located on the south banks of Pineview Reservoir and is a convenient ten-minute drive to Snowbasin ski area. The current onsite amenities include beach access, a swimming pool and hot tub. The Escapes has four (4) floor plans ranging from 2600-3600 SF, sporting 2-4 bedrooms and 1-2 car garages. Future development includes storage units, commercial space and a private gate for access.